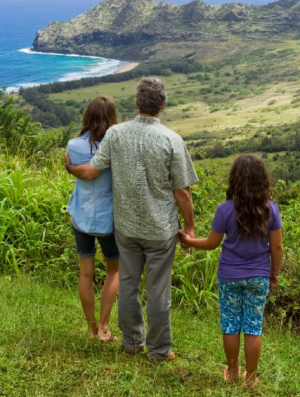 The movie takes place in Kauai, Hawaii and when we’re introduced to the main character, Matt King (played by George Clooney), it’s revealed that his life is far from paradise. We soon discover that Matt’s wife, Elizabeth King, suffered a head injury in a speedboat accident. She is comatose in a hospital and the doctor tells Matt that she is never expected to recover. We watch Matt as he receives the news from the doctor that keeping his wife on life support is not warranted. The doctor also tells him that he must follow his wife’s wishes as stated in her Advance Health Care Directive and take her off life support. Matt, as his wife’s agent on her Advance Health Care Directive is responsible for making the decision of when treatment will end. The raw emotion and pain of his role is unmistakable, especially as he tells his daughters and Elizabeth's family about her condition and what Matt’s accountable for. As Matt moves through his life as an attorney, a father of two girls, the grieving husband, and an over-worked trustee, I felt his struggle and heartache. The director, Alexander Payne is known for delving into difficult and complicated human relationships. In one of my favorite movies, Sideways, Payne also captured raw, human emotion in a thought-provoking way. I wholeheartedly recommend this movie. It was insightful, emotional and a tear-jerker (don’t forget your tissues!). The Descendants is my favorite movie of the year and I believe will be a major Oscar contender.